I've got to start my first publication post with a confession: I am not good at thinking of titles. I didn't think of the title for the first chapter of my master's thesis (or the thesis itself), my master's advisor, Joanna, did because she's great at titles. 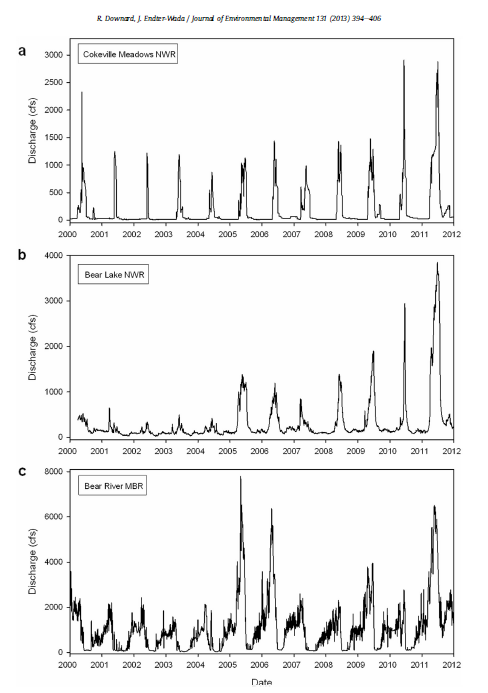 The paper "Keeping wetlands wet in the western United States: adaptations to drought in agriculture-dominated human-natural systems" is a comparative case study of the paper water and wet water acquired by three federal wildlife refuges in the Bear River watershed. In the western U.S., the right to use water is allocated under the rules of prior appropriation. Every water user must apply for the right to use water and that right comes with restrictions on what water can be used for, how much can be used, and when it can be used. During periods of drought, a relatively common even in the arid and semi-arid West, senior water right holders (those who applied for their rights first) get their whole water allocation while junior water right holders (those who applied for their rights most recently) will have their allocation cut off. There are lots and lots of intricacies of within the law, based on 150 years of court cases, many state constitutions, and inter-state water compacts, but the statement "first in right, first in time" is still the clearest way to summarize the law. Water law goes way back to the California gold rush, but appreciation for wetlands is a relatively recent development (coming in the 1970s). How have wetlands, a thirsty ecosystem defined by the presence of water, persisted in watersheds like the Bear River, where agricultural users have acquired almost all the available water? It depends (every ecologist's favorite answer). Every water user must apply for the right to use water, but the strategy for acquiring those rights varies based on where the wetland is located within the watershed (near the top or the bottom) and relative to senior water rights holders (upstream, downstream, or near a storage reservoir). 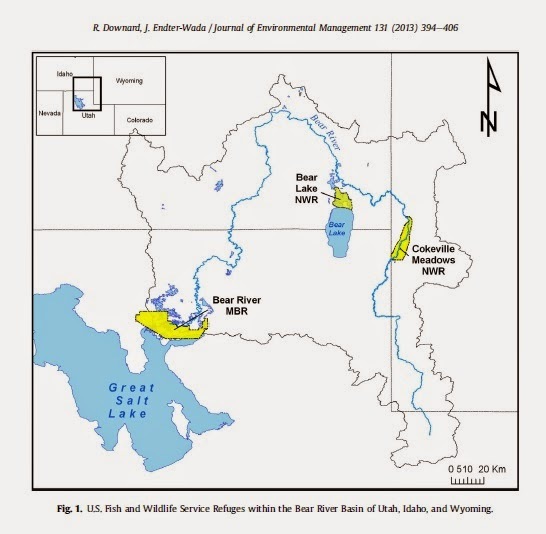 The federal wildlife refuges in the Bear River Basin, Bear River, Bear Lake, and Cokeville Meadows, have each pursued their own strategy, detailed in the paper linked here. Once a refuge has acquired access to water through applications, diligence claims, shares in canal companies, or purchases of rights with land, the water must be managed to buffer wetlands against fluctuations in water supply. Such management takes a context-specific approach that recognizes the opportunities unique to each refuge. Bear River discharge above three wildlife refuges.